The future will finally become the now when the clock reaches 4:29 p.m. on Oct. 21, 2015. That exact moment in time is the future to which Marty McFly (Michael J. Fox) and Dr. Emmett Brown (Christopher Lloyd) travel forward in the 1989 film "Back to the Future Part II." And while many things are better in the here and now than predicted in the hit movie sequel, many other foreshadowed developments have yet to come to pass. 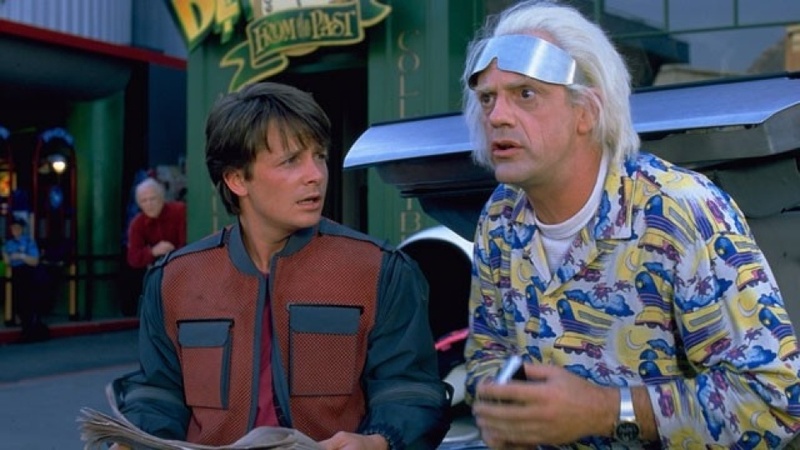 While Doc and Marty find themselves in the familiar environs of small town Hill Valley after traveling 30 years forward thanks to their DeLorean time machine, they must confront a future filled with flying cars, hoverboards, self-lacing sneakers and the fact that the Chicago Cubs win a World Series. To mark the crossing of this point in actual and celluloid datebooks, fans will be able to celebrate with a new Blu-ray and DVD release packaging the first "Back to the Future" with its two sequels, the futuristic version of Pepsi featured in the film, and the new documentary "Back in Time" featuring interviews with cast, crew and fans. "Back to the Future Part II" correctly predicted the use of video chat, specifically for teleconferencing. Though it also predicted that most business would be done via fax machine. In the film's version of 2015, however, random facts about the person with whom you're videoing appear on screen — as if today's Facebook offered a version of video chat. Physical digital screens were ambitious for the 1989 release date, but the film got it right regarding the size and flatness of what we seemingly have everywhere today. We'll give partial credit for this one: "Back to the Future Part II" got the form right but not entirely the function. The film shows flying robots used to walk dogs and shoot news footage. Although aerial drones are an increasingly important tool in video recording, we still have to take Fido out the old-fashioned way. In the film, Marty Jr. and Marlene are portrayed watching television on their glasses at the dinner table. We don't see the ubiquitous use of cellphones and texting in the film that we do in real life today, but the encroachment of wearable technology on family time was an eerily prescient prediction. Props to the film's producers and designers who show Doc driving the DeLorean wearing wraparound glasses which connect to the car, providing him with real-time information about his surroundings. Doc is also seen using a hand-held device in the film — not dissimilar to a smartphone — to source extra information about where he is. While Nike has been working on the technology, self-lacing sneakers are still not a common sight at your local Foot Locker or Sports Authority location. Similarly, the levitating hoverboard Marty used to glide around Hill Valley in the film is still not readily available at the local mall. But in 2015 "hoverboards" are soon to be seen rolling into a Wal-Mart near you. What is really a self-balancing-scooter — or Segway minus the stick — has become commonly referred to as a hoverboard today, and they are set to invade sidewalks possibly as early as Nov. 1. There's also a Kickstarter project underway to produce one-wheeled versions of the board, and the publicized Oct. 21 launch of the Hendo board which promises to actually hover via four engines that produce a magnetic field. When Marty sees two boys struggling to figure out how to play an arcade version of Nintendo's Arcade Gunman, he offers them a demonstration. Using the game's light gun, Marty quickly dispatches all of the bad guys on screen, only to be met with the boys' disgust: "You mean you have to use your hands? That's like a baby's toy!" Of course, most games today still use physical controllers, but many now implement hands-free devices, including Microsoft's Kinect, as well as Sony's PlayStation Eye and PlayStation Camera. Marty is frightened by a 3D hologram "Jaws 19" ad early in the movie. The monster fish franchise never progressed beyond a fourth installment, but 3D technology has become pervasive in not only big screen cineplexes but also via many high-end household flatscreens. In "Back to the Future II," the Chicago Cubs win the World Series by beating an unnamed baseball team based out of Miami which features an alligator for a mascot. In 1989, there was no MLB team based out of Florida. The Tampa Bay Devil Rays (now just the Tampa Bay Rays) would not begin playing until 1998. The Florida Marlins played their first game in 1993, but it was not until 2011 that the team would change its name to the Miami Marlins. Let's leave the last word on this prediction to "Back to the Future Part II" screenwriter Bob Gale. "I’ll tell you, some of the things in 'Part II' were half-assed predictions and some were just jokes — and this one was a joke,” Gales told Canada's Georgia Straight in January. "But... I’m a baseball fan and if you were going to pick a Cubs team and say they were going to be contenders, the 2015 Cubs have to be on the list. ... Even guys who are on the Cubs have seen 'Back to the Future II' and they’re saying 'It’s been predicted, we’re the team of destiny!'"